It’s hard to miss the Conrad when you are driving in Hong Kong (the district) area. 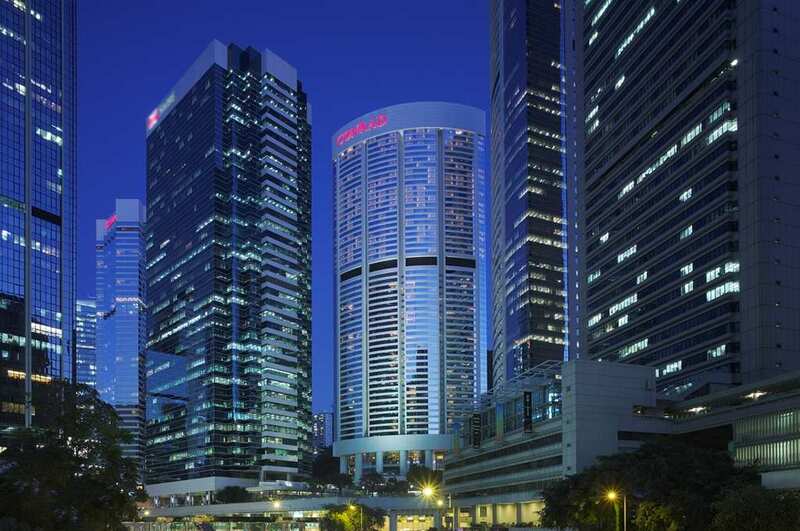 Amidst the close-knit buildings side by side in the area, the Conrad brand stands out with its slightly curved shape . Big shoppers, rejoice. 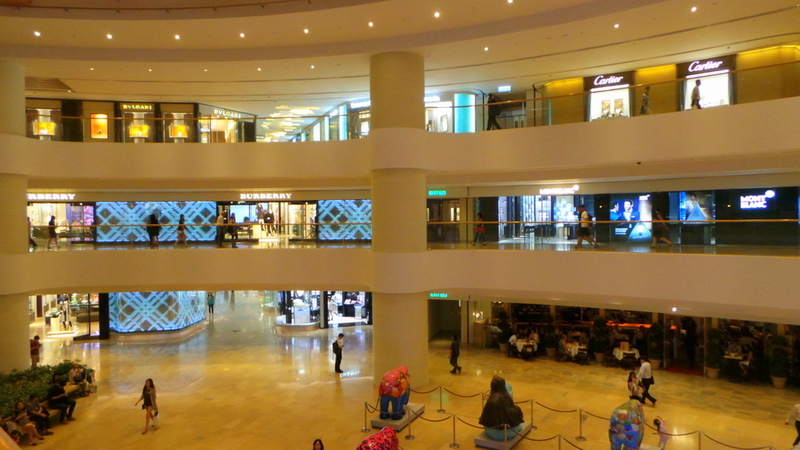 The Pacific Place , a shopping mall for high-end brands is located just beneath the Conrad. They are also interconnected so you can shop or eat at the restaurants without getting out of the building. 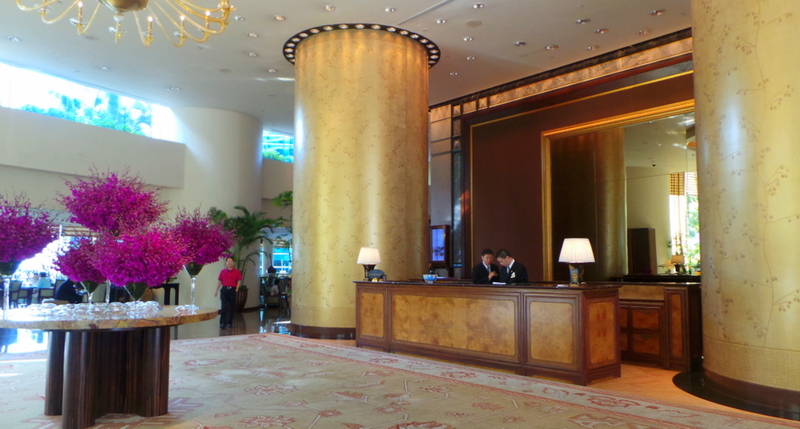 The Conrad is in Hong Kong side and the nearest MTR station is Admiralty. The Pacific Place is also interconnected to the station so again transport is extremely easy. The Conrad is also just a 4 minute drive from the Australian High Commission. 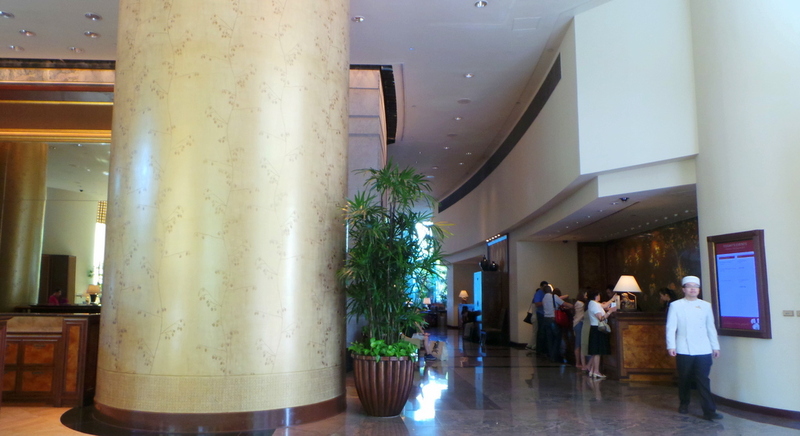 The lobby was pleasantly spacious and allowed lots of natural light, which I’m a big fan of. Most noticeable were 2 grand pillars which seemed abit distracting but I’m glad they were painted and decorated nicely. The check-in was done the traditional way at the desk. Our room was on the 61st Level, on the y that faced Kowloon side of Hong Kong. It had a harbour view as well, albeit surrounded by other buildings. Executive room floors are from level 57 and above, and this comes with access to the Executive lounge where you can have breakfast, and have complimentary wi-fi. At 42 Sq metres, the size is quite roomy for Hong Kong standards, but it’s exactly the same size as the non-executive floor rooms. To me, being on the executive level may be more attractive for guests to book if it had more advantage room-wise (such as size perhaps). The views are great, and we even saw a helicopter fly and land in one of the building’s roof nearby. The bed was very comfortable, and they also had a pillow menu of soft and firm. I got the biggest surprise (and disappointment) that as a popular chain for luxury and business, the Conrad Hong Kong does not include Wi-Fi. It is available for purchase in 24 hour blocks. 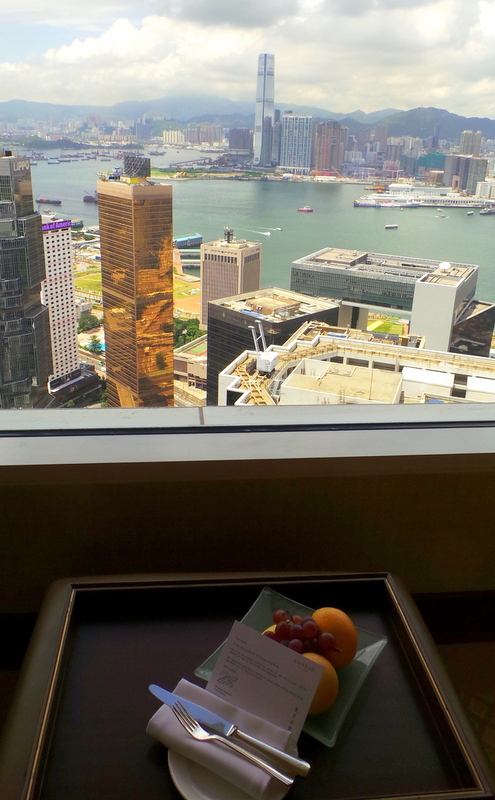 There was a fruit plate as welcome amenity, which was later complemented (at turn down service) by chocolates in a dim sum basket. I was hoping to see one of the famous Conrad teddy bears in the bed but alas there wasn’t any. I liked that there was generous provision of bottled water- 4 per day. I was pleased to this when I opened the working desk. 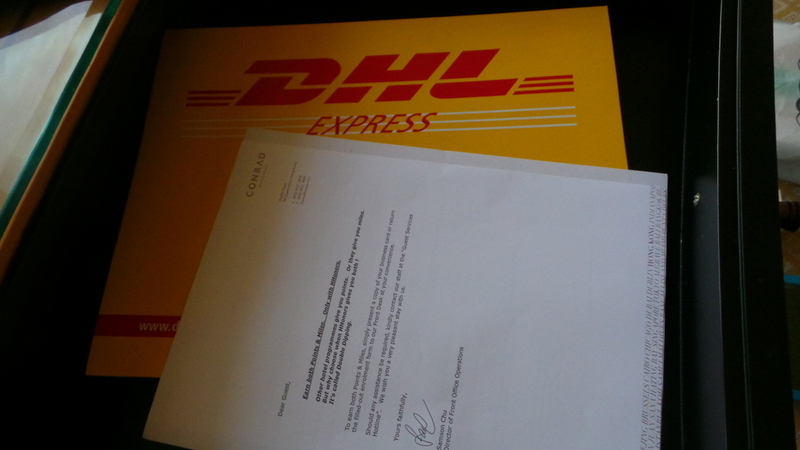 I didn’t need to send anything but as I mentioned, the Conrad Hong Kong is popular among high-end business travellers so this is handy. 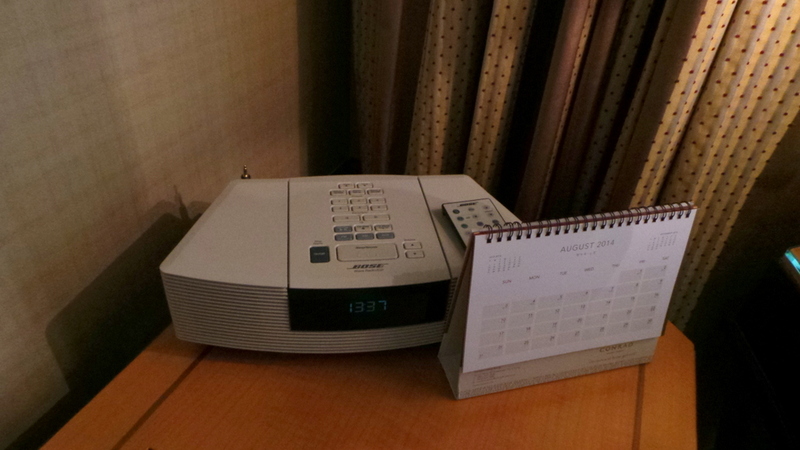 Sure it is a very functional Alarm Clock and CD PLAYER 🙂 At this day and age, I haven’t seen a CD Player (inside a luxury hotel) in ages! It’s a nice vintage touch but out of place for a Conrad. The toilet and the shower area are also separate. 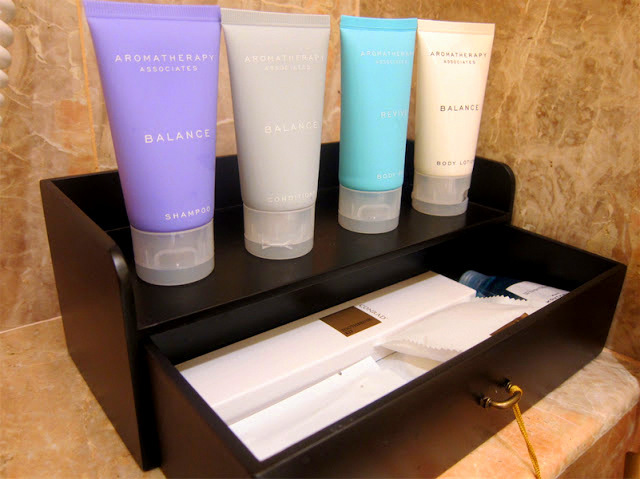 Toiletries are from Aromatherapy Associates. I liked the lotion the best as it soothed my mosquito bites. 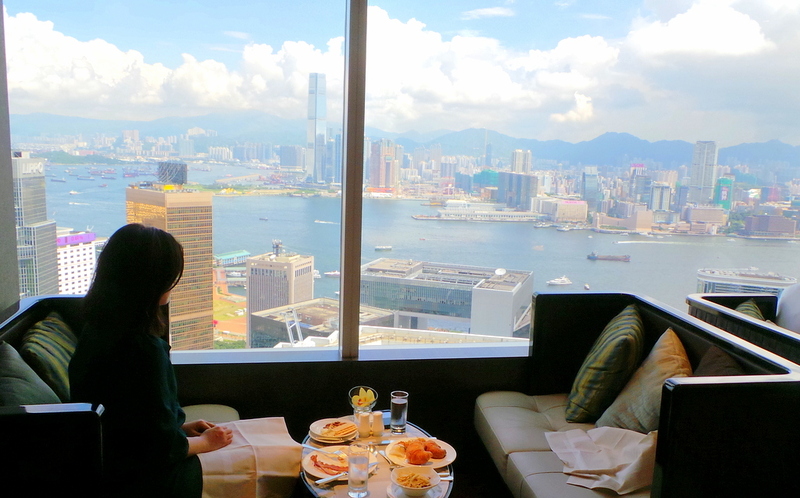 The executive lounge, located at level 59, offers really magnificent views at breakfast. One of the benefits of being booked at an executive level room is the exclusive access to this lounge, which offers extra privacy. 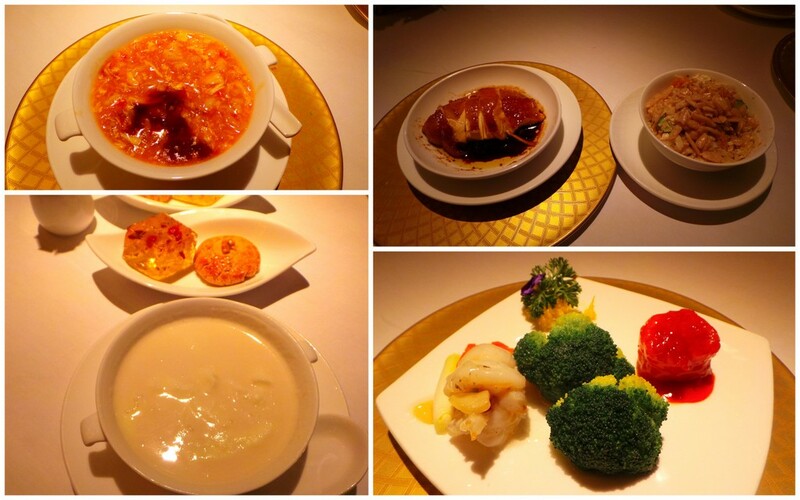 There was a nice balance of bread, cereals, continental, western and asian-oriental choices (dimsum, noodles, etc). 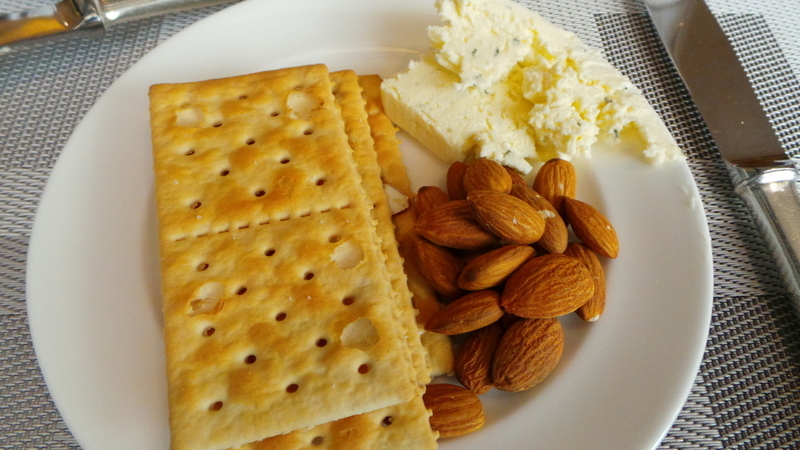 After days of non-stop eating dimsum and paos (soft buns), I wanted something “dry” but still high in fat to keep me going. 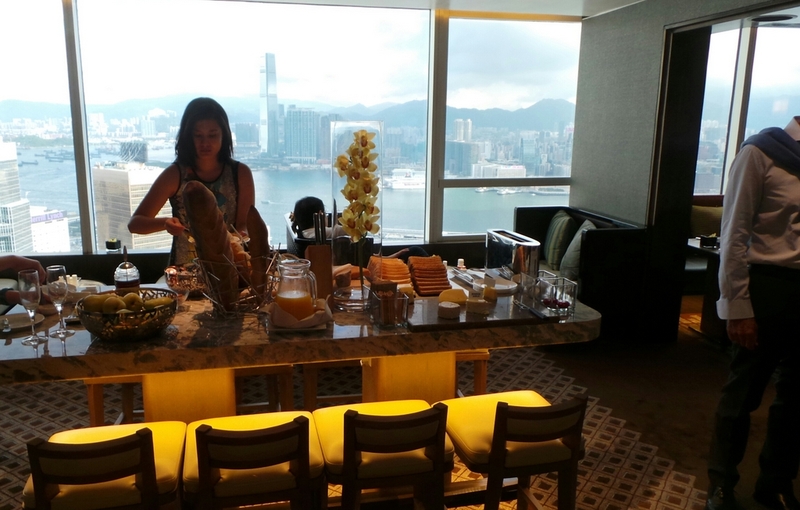 I really loved the views of the executive lounge and its easy to have a very lingering breakfast, so if you are booked at an executive level room, it pays to have breakfast early! 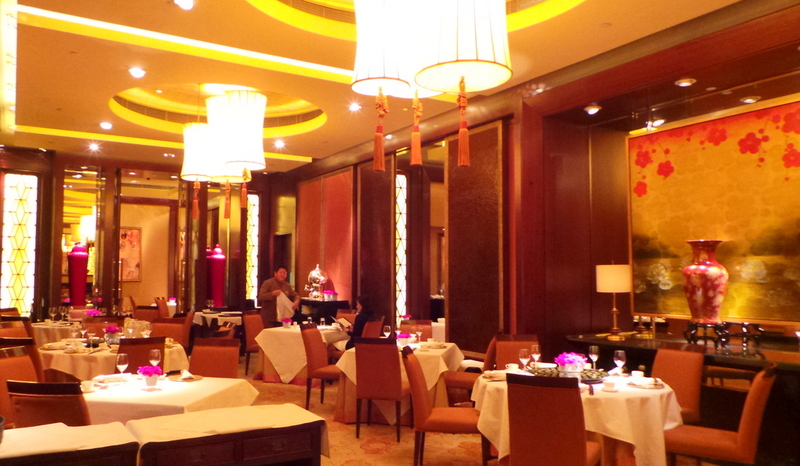 Conrad Hong Kong is home to Golden Leaf Restaurant, a one-Michellin starred restaurant specialising in Cantonese cuisine. I loved the setting and ambiance as it infused both modern and traditional elements. And I would later find out too that the food is even more impressive. 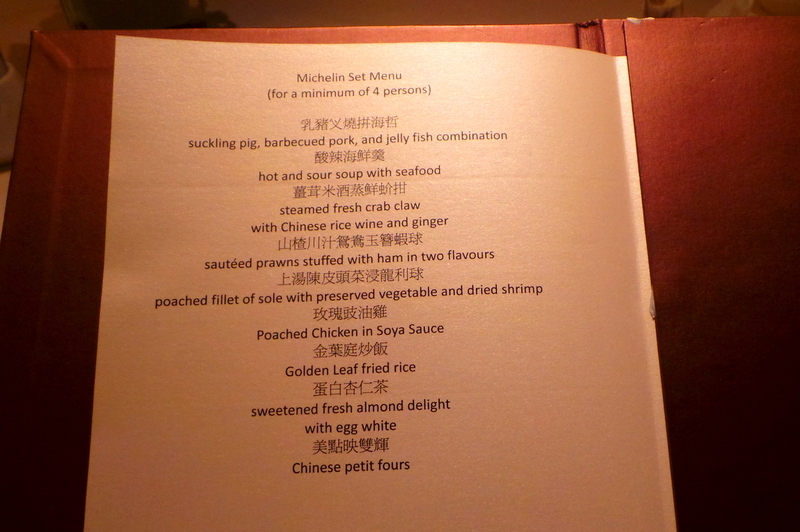 The starter plate featured the classic appetizers on sit-down Chinese restaurants. 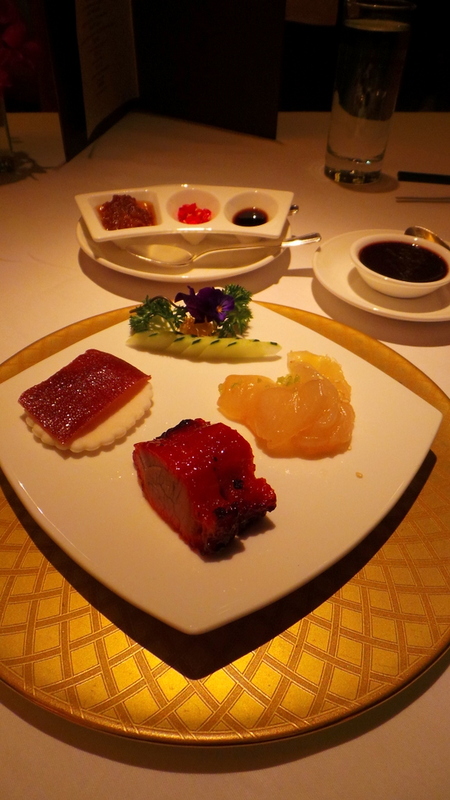 The jellyfish had the absolute right texture – crisp and juicy, and was the perfect combination to the meats. And even when the rice was served last (as it does on some Asian/Chinese set menus), I still had the gusto to eat my Poached Chicken in Soya Sauce with it, which says a lot about how I loved the menu. The true test was the hot and sour soup, a dish that both Zombie and I would normally order last among all soup choices, as we both don’t like chilli or sour, but this soup was done so delicately and with just the right smidgen of ‘hot’ so we both devoured it on the spot. There was no acidity to the soup at all which I liked. 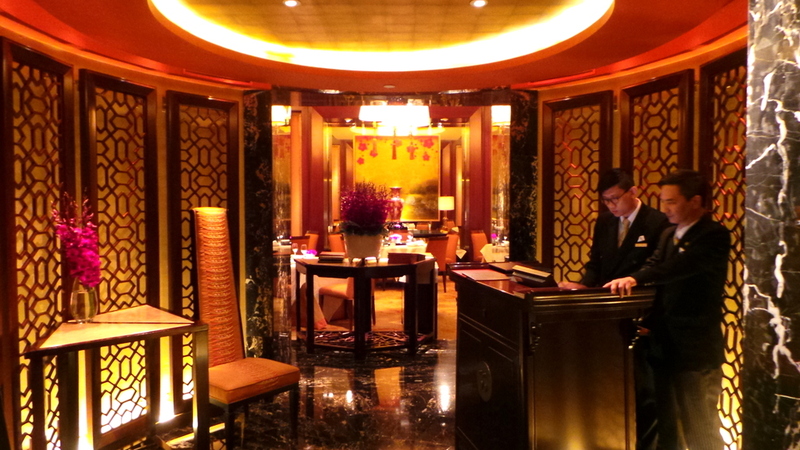 The 2 areas of Conrad Hong Kong where service was great – The Golden Leaf Restaurant, where waiters and the manager were very attentive and attune to what we needed. The frontline staff were great too (Doorway Staff and Bell Men). 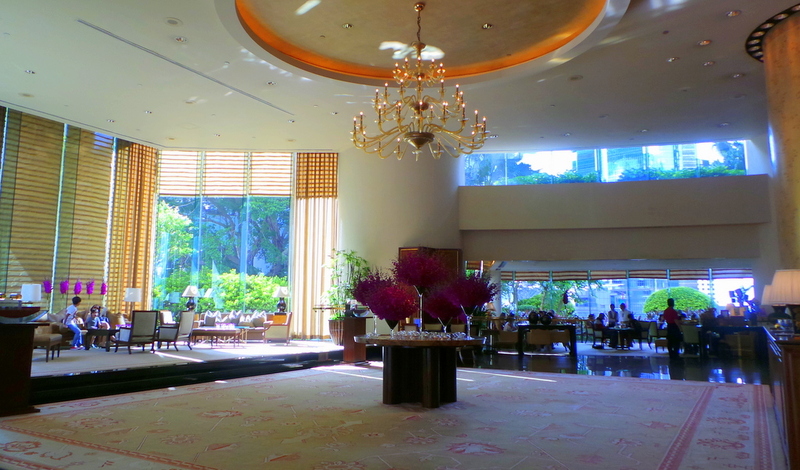 The rest that we encountered – Check-in, Lobby and the Executive Lounge staff, the service felt rushed and curt. As an example, the staff who brought us up to our room didn’t say a single word while we were at the lift from ground floor until level 61, which you can imagine is a long way up. I heard and read a lot of good things about the service from the Executive Lounge. I didn’t receive or see anything horrible but nothing outstanding either. A lot of business travellers, few families. Majority of the leisure travellers/guests were adults. As Conrad is part of the Hilton group and can be booked with enough rewards on Hilton HHonors, many of the guests are North American as well. 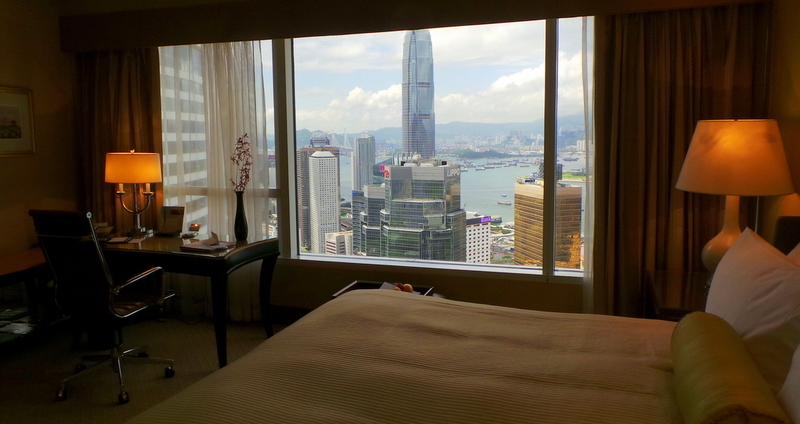 The highlight of Conrad Hong Kong for me is the location. Transport is extremely easy and convenient and let’s face it – nothing beats being connected to a mall. Second asset is the Golden Leaf restaurant. We love Chinese food thus our tastebuds can also gauge when a Chinese restaurant is really worth its Michelin star and worth coming back to over and over. For the location and food alone, I’d stay here again. As I’d love to see the Conrad Hong Kong improve, sprucing up needs to be done on the smaller details of the room, and service. Do you like Chinese food? What’s your favourite dish? 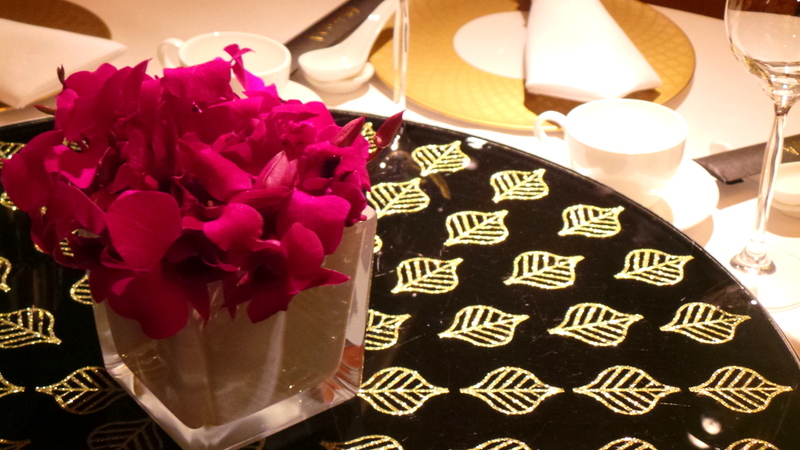 We were guests of Conrad Hong Kong, but all views and opinions of this post are mine. Oh my! What a nice view!! 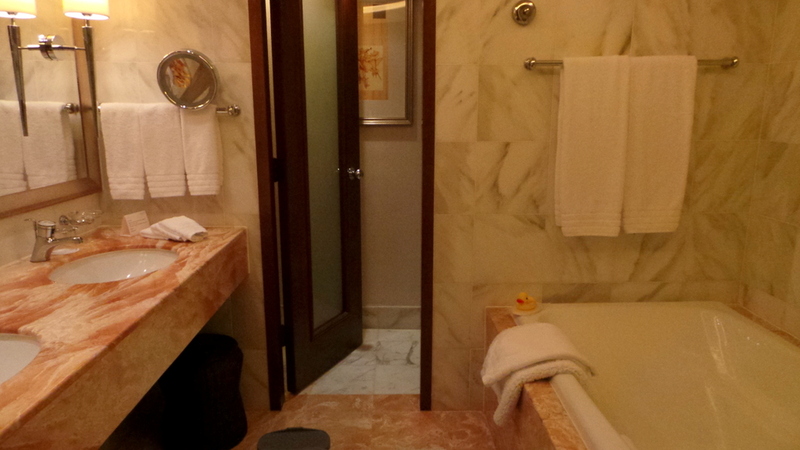 Love how big the bathrooms are, and totally in love with that big comfy bed too! Seems like you had a great time! Thanks for the visit Pamela, I really had a great time 🙂 I need another getaway! I really don’t know much about Conrad hotels having never really stayed in one but there are some nice touches there although some things really seem like they need updating. Especially for a business hotel! 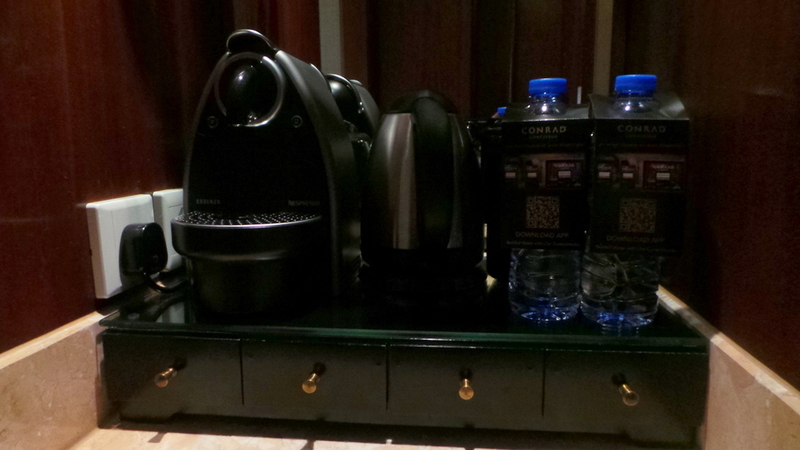 Hi Lorraine, it’s my first to stay at a Conrad and I have heard great things and I was quite sad to see details that were out of place in the room like the cd player, the hairdryer (which I think they knew because they had a ready modern one at the closet to be used separately). And the Wi-fi! I think a refurb in room details and service would definitely make the stay more memorable to guests. But the views and the restaurant were really good. 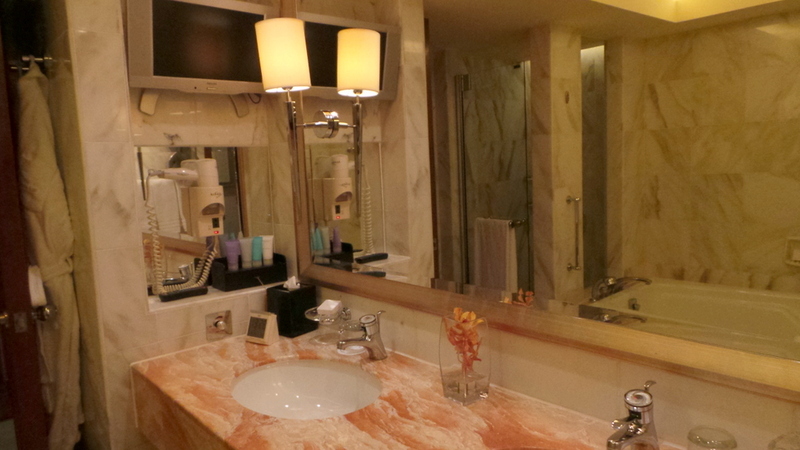 It looks like the Conrad certainly doesn’t disappoint! We’ve got one here in my hometown, and I’ve heard nothing but good things about it as well. What a great view! The view is the thing I love the most here & it does look all very sheek & ticks most of the boxes, but seems like it could do with a bit of a refurbish, after all, it is pitching to people expecting the best. Always good to read your reviews. Hi Anna, agree with you completely the view was the biggest wow factor. 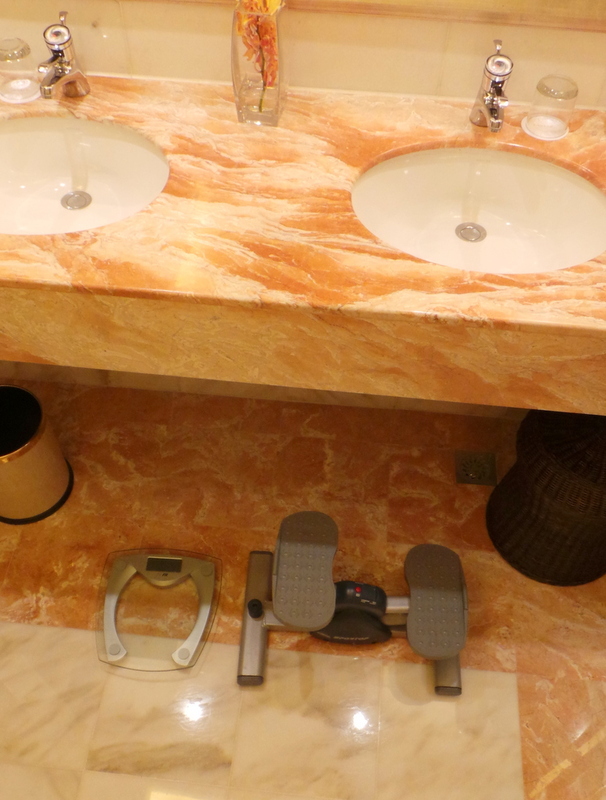 I’d really love to see the Conrad Hotel refine some of the bits — I mean they’re just small details really. No major renovation needed. But you’re right in saying that seasoned travellers (business travellers – since they cater to them) may expect more. Stayed there about 10 years ago & had the best nights rest after a long flight. Would love to know the name brand of the mattresses they use. That’s such a nice detailed review. Do you happen to remember your room number though? So we have an idea which rooms to choose when checking in on their app?